I have often said that over the years some of the cooks I've worked with haven't been all that bright, to say the least. I was working at a restaurant at a busy airport and we had daily visits to our dumpster by a skunk for over three months. We were going through cooks at that period like one every few days. The skunk was really no problem. When you went down by the dumpster you merely opened the door to the outside, banged on it a couple of times, the skunk's head would pop out of the dumpster, he'd drop to the ground a considerable distance for a skunk, and waddle off to watch you for a time until you left the dumpster and then he'd come back when you left. I had taken to leaving scraps by the curb so he wouldn't have to climb in. I found he was a vegatarian and had a great fondness for celery ends. Well, we warned everybody coming to work that he was down there and not to bother him. We had a big, overbearing cook start working that nobody liked almost immediately. Smoking was still allowed in the break area at that time, but for some reason he wanted to go outside and smoke. Apparently he was down back smoking when the skunk headed back for some of the goodies I'd left him, and the cook picked up something and threw it at the skunk. The skunk got him right up the nose! I heard the screaming, ran downstairs, the skunk was waiting patiently under the gas tank for me to remove this offensive person. It ended up we had to take him to the hospital and he had to stay there for three days! You do not want to inhale skunk spray! Anyway, the only reason the guy came back was to get his paycheck. He had no intention of working there any more. When the skunk finally disappeared everybody kind of felt bad he kept the riff raff away. But there were no reports of him getting run over or anything, so we think he headed back for the woods for the winter. But being a country boy I was smart enough not to mess with a skunk. We wish everybody else was! The dumpster area just about took your breath away for two weeks until it finally died out. We tried everything; industrial deoderizer was sprayed on the walls, I scrubbed them several times to no avail. Let's face it, what mother nature produces man has a very hard time coping with! People have tried but they've never quite come up with anything as good as skunk oil! Gerald holding the chair that collapsed under him during the Easter battle. 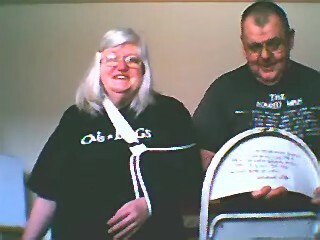 Linda in her sling for her broken arm. The demons are causing all kinds of trouble!